"Always echoing and showing great respect for the musical soul of Pade"
One late afternoon in January 2016, when I came home, I knew some-thing just wasn’t right. I sat down on the sofa and waited. A few minutes later I found out: A journalist from a newspaper rang to ask whether I had a comment on the death of Else Marie Pade. I didn’t – at first I had to collect myself for a while before I could say anything at all. Else Marie dead. Despite her age and the course of her illness over the past few years it was so completely unexpected for me. I sat for a long time and thought about her, and about her music. And I thought about how, just a month before, I had spent an afternoon in a research library in Berlin, where I had come across a German book about Danish musical life, in which Else Marie’s works in particular were given such generous attention that the author of the book clearly counted her among the most significant Danish composers. I had reminded myself that I had to tell her this when the occasion arose. But it never did. It was a special evening listening to her music in the dark. My thoughts went back to our first meeting almost 15 year earlier, when I had turned up along with Ingeborg Okkels at her address in Ordrup, north of Copenhagen, to write a portrait article about her for Dansk Musik Tidsskrift. I also thought about the meetings that came later, and which led to coach rides in the Deer Park, north of Copenhagen, coffee at the nearby Bakken amusement park, lunches at Café Paludan in Fiolstræde in the old city centre of Copenhagen, receptions, birthdays and other things, usually in the company of other electronic music buffs in my circle of acquaintances. I also thought about how our contact, for various reasons, had petered out a little, and how my last greeting to her was a postcard I sent for her 90th birthday. In the course of that evening I listened to the tape composition Etude (actually Etude 1). The work, I found out later, had been created in 1961 and had been premiered on the radio programme Vor tids musik (Music of our Time) in April 1962, being met by the music critics of the newspapers with greater enthusiasm than electronic music normally was. The work had been released for the first time on the anthology Pioneers: The Beginning of Danish Electronic Composers by the -Danish recording label Ljud Records in 2008, but this evening I heard it on the album -Electronic Works 1958-1995, curated by Jacob Kirkegaard and released in 2014 by the American label Important Records. In this work – as in many other works by Else Marie – I experienced an emotional jumble that I couldn’t properly describe except as the sound of several things at one and the same time: the struggle for recognition, the right to be oneself, and the attempt not only to come to terms with the period of the Nazi German Occupation of Denmark (1940-1945) which had left such deep marks on her, but also to distance herself from it. Because: The war was the old world – and the old world vanished when the war was over at last. It had been absolutely necessary to put something new in its place: a music of the future which was in reality a music of now, a music of the nuclear age. Pierre Schaeffer knew that in France, Karlheinz Stockhausen knew it in West Germany, and Else Marie knew it in this country, just like these two, for her, inspirational figures did. In Etude I I also heard something that I could recognize from other works by her: the consciousness of being destined to go her own way, against the current and thus also to go off the beaten track – even if she thus risked partial artistic isolation. And I couldn’t help but see the title of the work as expressing a characteristic Else Marie-like modesty, although étude has been a well-known work designation among composers for centuries – and was used in the post-war years by among others Schaeffer and Stockhausen. Yet in the light of Else Marie’s death the title still seemed rather unreal: for more than anyone she knew that life and art are far from being an exercise. But this very unreality gave the work a special aura that it could not have had until now. As I sat there in the living room I felt a lacuna in my life that I soon realized I would attempt to fill by celebrating Else Marie with a tribute album on which a number of musicians would have the opportunity to work with her music. And when I saw the duration of the work on the display – 5 minutes and 33 seconds – I also knew how the album was to take form: I would invite a group of musicians to remix the work in their own ways, and each remix was to have exactly that duration. For 5 minutes and 33 seconds – that is, a total of 333 seconds – is such a spectacular number that simply considering it makes us aware how each second counts; in the work as well as in life. The number also gives us a hint of the enormous accuracy that was required to work with electronic sound sources, as was the case with this work too. And the figure had a meaning too in Else Marie’s own life; for she was just 46 days short of having lived 333 days exactly a hundred times. 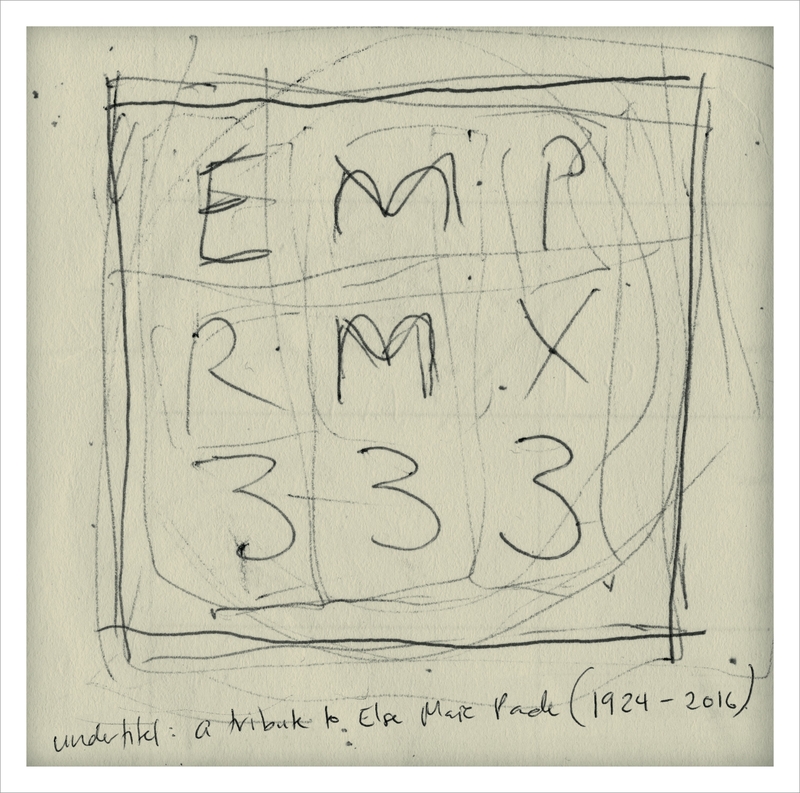 Hence the title of the album: EMP RMX 333, where EMP is her initials – or the abbreviation for electromagnetic pulse; RMX is the three consonants in the word remix; and 333 is the number of seconds per track on the album – or the numerological figure for the union of mind, body and spirit that says we are all one, and that everything (including all sounds) runs in parallel. EMP RMX 333 sounds like a secret code from a remote time. It is like the inscription on a diode. And it could be the serial number on an electronic apparatus. But is also evokes associations with the identity numbers that were tattooed on the concentration camp prisoners. Or could it instead be the pet name for a humanoid robot from the 22nd century? So, the album is now a reality with, first, the original work and then 11 very different remixes or new compositions inspired by the work. As We Like We men-tion in a note on their contribution, and which is also mentioned in the introduction to the work, Else Marie Pade wrote a programme note when the work was released, saying among other things: “The first sound is set in motion, is caught up by the next, which is caught up by the next, etc., in a powerful crescendo.” That is the spirit in which the album is created: the original work was the first sound that is caught up by the next sound in the form of the next remix, which is in turn caught up by the next remix, and so on. Thanks to every single contributor on this tribute album for the musical will to pay tribute to Else Marie, for commitment, for dialogue, for inventiveness and not least for responsiveness to the many potentials of the original. And to you, Else Marie: Thanks for everything. Else Marie Pade graduated as a pianist from the Royal Danish Academy of Music in 1949 with subsequent private composition lessons with Jan Maegaard, Vagn Holm-boe and Leif Kayser. But it was only after hearing a radio programme in 1951 about the musique concrète movement – and paying a visit the next year to Pierre Schaeffer in his ‘radio laboratory’ in Paris – that her path as an electronic pioneer was laid out in earnest. Throughout the 1950s she created a succession of works under the auspices of the Danish Broadcasting Corporation (from 1959 called Danmarks Radio). They were based on Schaeffer’s techniques and principles and included En dag på Dyrehavsbakken (A Day at the fair) (1953-1955) and Symphonie magnétophonique (1958-1959). From 1955 she was permanently employed by the broadcasting service and spent her every---day working life among the country’s leading radio technicians, where it was the chief engineer Holger Lauridsen who introduced Else Marie Pade to the latest electronic apparatuses and their potential for generating and manipulating sounds. The collaboration suddenly broke down at the end of 1957 by Lauridsen’s early death. But the technologies and the techniques lived on in a creative collaboration between Else Marie Pade and a group of able technicians including Svend Drehn Knudsen, who for the next five or six years helped her to realize the ideas and works that filled her most productive period up to and including 1962. This was the case with Etude (actually Etude 1), composed in 1961 and premiered on 4 April 1962 in the radio programme Vor tids musik. The use of the word ‘étude’ in the title of the work was very probably inspired by Schaeffer’s early compositions, all of which were designated ‘exercises’ (‘étude’ means ‘exercise’ in French). The underlying logic is that before the composer is ready to create decided works, the ‘sound object’ – that is, the sound itself – must first be studied thoroughly, and this is best done through ‘studies’. A sound object is so to speak a sound detached from its reference to the world, For example, we can choose for ourselves whether we want to listen to the sound recording of a doorbell as something we know from everyday life – that is, as “the sound of a doorbell” – or listen to it as pure sound, that is, as a high, metallic sound that starts with a “drrrrr” and then fades out with an “-innnnnggggg”. In other words, as an abstract sound or as an ‘object’. Schaeffer works to peel away the everyday meaning of our listening and to arrive at ‘sound for its own sake’, and thus comes up with two composition methods where the composer functions as listener: the sound can either be looped (i.e. the same sound process can be repeated many times) or it can be changed with the aid of sound effects (i.e. manipulated electronically), so that it changes character. Com-mon to both listening methods is the fact that the composer becomes better at focusing on the character of the sound as sound, which makes it a potential musical building-block. In Schaeffer’s quest to discover and understand sounds he needed to go even further in his ‘exercises’ with sound. Looping the sound is one thing, but what if the sound is drawn out or sound effects are added, such as reverb and delay? How is the sound perceived then, and what does it reveal in that case about itself? Schaeffer finds a parallel in the philosopher Edmund Husserl, who speaks of “free imaginative in variation”. Manipulating a sound by means of sound effects is as much a study of the sound as listening to it, for through the transformation of the sound we become aware of what it is in the sound that does not change – and what constitutes its essence. The philosophy is that before we can begin to create works, we must know the essence of the sound material. And this philosophy, besides humility towards the work with the sound material, is something Else Marie Pade very probably brought with her from Paris when she called her work Etude. Holger Lauridsen’s introduction of electronic sound generation aroused Else Marie Pade’s interest in also taking up the work with pure electronic sound-universes and the so-called Elektronische Musik which had the West German Karlheinz Stock-hausen as its most prominent figure. She met him for the first time at the World Exhibition in Brussels in 1958. A few years later he visited Else Marie Pade and fully acknowledged her as a serious contemporary composer by playing her works in other contexts. After that, they met at regular intervals at the Darmstadt courses in the 1960s and during his visits to Denmark, and kept up contact until his death in 2007. From the beginning, with his first electronic works in the early 1950s, Stock-hausen was driven by a powerful artistic wish to ‘start all over again’, after the Nazis had compromised many of the composers, melodies, harmonies, forms and instru-ments of art music. But the electronic technologies for music recording and radio broadcasting in the post-war years enabled the production of new sound material. So at first Elektronische Musik had the character of basic research in sound where Stock--hausen, with the aid of apparatuses actually intended for physical sound ana-lysis, created a pure electronic music without recordings of real-world sounds or other recorded sounds as basic material. The fundamental ingredients in this music are sine tones (single frequencies without harmonics – ‘dooot’) and noise (many random sine tones one above another – ‘sshhhh’). “Etude I” consists of a number of very different sounds of different timbre and duration. The first sound is set in motion, is caught up by the next, which is caught up by the next, etc., in a powerful crescendo. “Etude I” is allowed to run out under its own steam since the most persistent sound ends by dying out in its own reverberation. It is a multi-layered tape echo that causes the process. By this time her compositions were strongly inspired by Stockhausen’s sound-universe. In particular Stockhausen’s pioneering work, the three-minute-long serial work Studie II from 19541 based on so-called white and pink noise, is an obvious candidate as inspiration for Etude. In the work Else Marie Pade explores the possibilities inherent in purely electronic sound material – and at several levels, since she investigates the transitions between different types of electronic sound material from pure noise to bell-like chords built up of sine waves whose timbres she manipulates by means of various sound effects (reverb, delay, -volume etc.). The bell-like sounds in particular can be clearly recognized from Stockhausen’s Studie II, because it sneaks in the acoustic image of an actual bell. Besides working with various types of electronic sound-material she also works with condensations of various loop sound layers. She adds effects to them in the form of delay and tremolo, so that long waves of sound sequences emerge which weave in and out of one another like a long succession of pulsating motions. Last but not least, she explores transitions in the actual musical structure by moving from the simple to the complex; that is, from the investigation of one single sound to a multi-layered structure of sounds – separated into units or as a unified sheet of sound. All this is twisted, turned and stretched into long wordless questions with no real answers. Etude ends with an infernal crescendo of noise which is not resolved, but only fades out. Where is the music going? Well, where is the world going, here at the beginning of the 1960s? The music leaves that to the listener’s imagination. Etude also holds another of Else Marie Pade’s special compositional characteristics – -subtle humour, for example something that recalls the croaking of frogs or other recognizable every-day sounds that peek out among the extended passages of long, abstract sheets of sound replete with noise and sine waves. The sudden reference to an everyday sound in the midst of an abstract sound-universe is not something Else Marie Pade was alone in using. Nor is the effect as innocent as it may sound, for in Schaeffer’s early work Cinq études de bruits from 1948 we find the movement Étude aux tourniquets, which similarly has ‘the childlike’ in focus. For it includes the sounds of toys whose sudden appearances here and there surprise the listener in an otherwise consistently electronic composition. Apart from the refreshing aspect that they slightly deflate the earnestness of the avant-garde, the ‘childlike sounds’ in Schaeffer’s as well as Else Marie Pade’s music point back to the dogma that “all sounds are equally valid” – whether they are noise, sine waves, the croaking of frogs or spinning tops. This is a motto that Pierre Schaeffer borrowed from the composer Edgar Varèse, and which refers to the possibility of expanding the musical material to encompass not only the sounds of the orchestra – but all sounds.